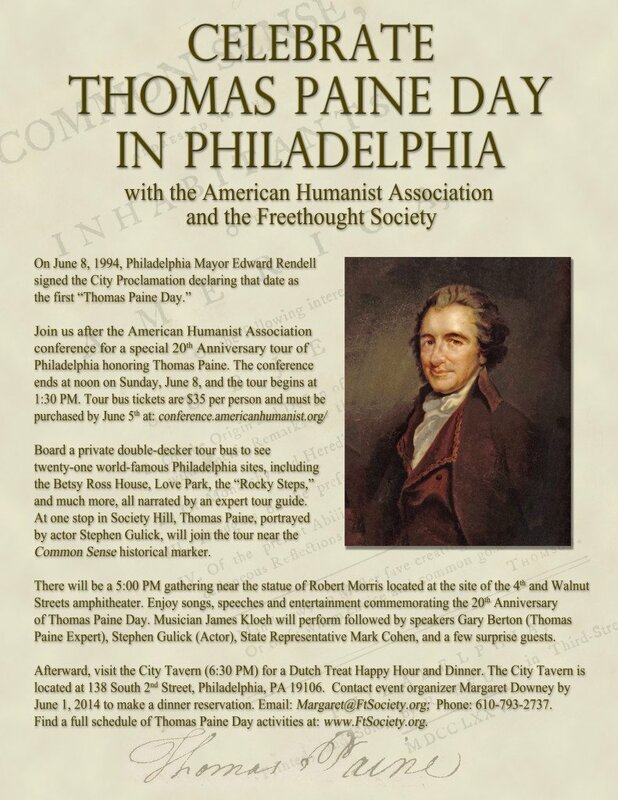 On June 8, 1994, Philadelphia Mayor Edward Rendell signed the City Proclamation declaring that date as the first “Thomas Paine Day.” Read more about Thomas Paine on the Freethought Society’s Thomas Paine Memorial Committee page. Board a private double-decker tour bus to see twenty-one world-famous Philadelphia sites, including the Betsy Ross House, Love Park, the “Rocky Steps,” and much more, all narrated by an expert city guide. At one stop in Society Hill, Thomas Paine, portrayed by actor Stephen Gulick, will join the tour near the Common Sense historical marker. There will be a 5:00 PM gathering near the statue of Robert Morris located at the site of the 4th and Walnut Streets amphitheater. 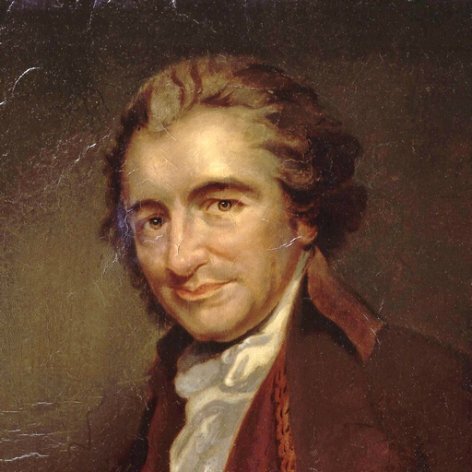 Enjoy songs, speeches and entertainment commemorating the 20th Anniversary of Thomas Paine Day. Musician James Kloeh will perform followed by speakers Gary Berton (Thomas Paine Expert and FS presenter), Stephen Gulick (Actor), State Representative Mark Cohen, and more surprise guests. Afterward, visit the City Tavern (6:30 PM) for a Dutch Treat Happy Hour and Dinner. The City Tavern is located at 138 South 2nd Street (at 2nd and Walnut Streets), Philadelphia, PA 19106. Contact event organizer Margaret Downey to make a dinner reservation by June 1, 2014. Email: Margaret@FtSociety.org Phone: 610-793-2737. A double-decker tour bus departs from the front of the hotel at 1:30 PM. Walking tour begins, to Thomas Paine Historical Common Sense Marker and Thomas Paine Place Philadelphia with photo opportunities with a Thomas Paine actor (Stephen Gulick). At 3:30 bus departs Sheraton to take some people to the next stop or back to the hotel. A behind the scenes tour of the print shop by Park Ranger and Thomas Paine expert, Joe Chauncy. At 4:45 PM the bus returns to the Franklin Print Shop and Square to pick up people needing transportation to the next stop. In front of Robert Morris statue Philadelphia attendees will be entertained by folk singer James Klueh after which speeches will be delivered by State Representative Mark Cohen and Thomas Paine Educator Gary Berton. Dutch Treat Dinner– Contact event organizer Margaret Downey to make a dinner reservation by June 1, 2014. Email: Margaret@FtSociety.org Phone: 610-793-2737.